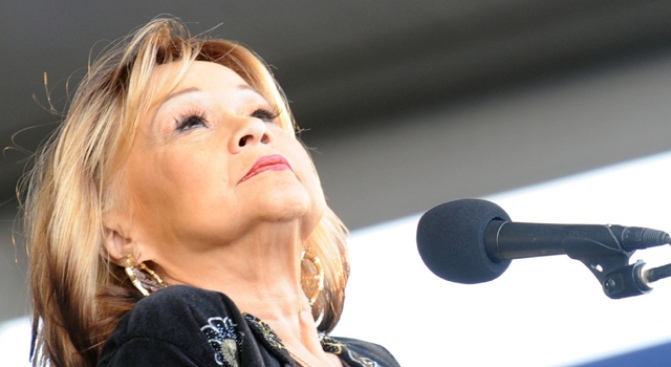 Soul legend Etta James brings it to B.B. King's this week. She may now be the woman associated with the Inauguration Song That Wouldn't Die (and no, we're not talking about Beyoncé), but if that's all you know of the oeuvre of Etta "At Last" James, get yourself to B.B. King's posthaste. Now 71, the sassy, brassy chanteuse -- born Jamesetta Hawkins -- has recorded some of the most memorable songs of the last 40 years ("All I Could Do Was Cry," "Sunday Kind of Love," "Don't Cry Baby), as well as some of the raunchiest (give a listen to "I Just Want to Make Love to You" and just try not to get a little hot under the collar). She's had her music covered by everyone from Madeleine Peyroux to the Rolling Stones, been inducted to the Blues and Rock and Roll Halls of Fame, and won pretty much every music award several times over. So what's left? Plenty, as it turns out. When she takes the stage at B.B. King's backed by the Roots band for three shows starting Monday Night, the contralto will serve up classics but also plenty of surprises -- word has it she's put her own inimitable spin on Prince's Purple Rain, among other modern tuneage. They don't make 'em like Etta anymore, there aren't may of her ilk left, and she's got more soul in one pinkie than Beyoncé could stockpile in a lifetime. Don't miss it.